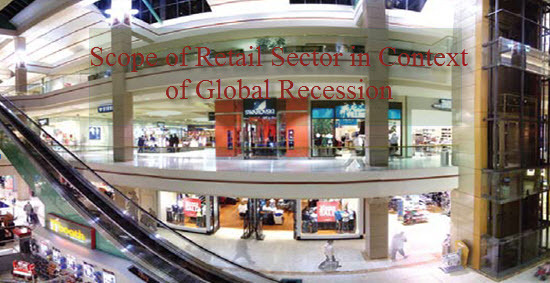 Scope of retail sector in context of global recession is a good MBA project and B.Com project which introduce you to retail and the global retail industry. The scope of this project is limited to provide an understanding of the impact of the recent recession period on the retail sector in India. Hence, the retail sector itself is covered enough to provide a basic understanding of its current state. You can also Subscribe to FINAL YEAR PROJECT'S by Email for more such MBA/B.COM projects and seminars. The Indian retail sector is highly split with 97% of its business being run by the unorganized retailers like the traditional family run stores and corner stores. The 3% share of organized retail is quite low when compared even to the other emerging countries. Indians have grown richer and thus spending more on vehicles, phones and eating out in restaurants. The spending is focused more outside the homes, unlike in other Asian countries where consumers have tended to spend more on personal items as they grow richer. A recession generally refers to a period of general economic decline; typically defined as a decline in GDP for two or more consecutive quarters. The future for organized retail in India is a bright one. The demographics, the sense of optimism and the deep-rooted entrepreneurial culture are ready ingredients for success. The retail industry needs to get organized and drive its own destiny.